SEE ALSO: The Best Liverpool goals. Liverpool are closing in on a deal to sign former Barcelona goalkeeper Victor Valdes, who will provoke an intriguing battle with Simon Mignolet for the Reds number one spot. 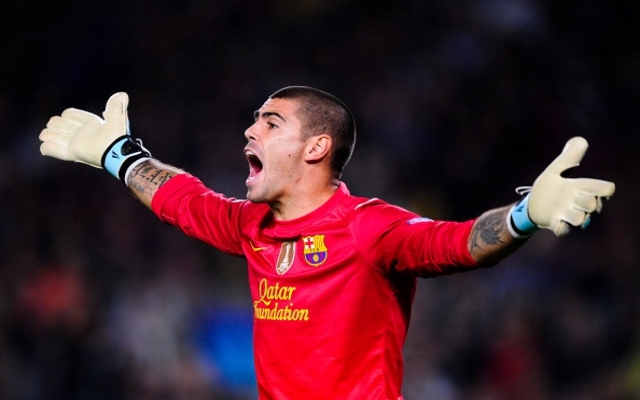 Reports in the Daily Express suggest that Liverpool have agreed personal terms on a one-year deal with Valdes, and the free agent is set to link up with the likes of Steven Gerrard and Mario Balotelli imminently. Brendan Rodgers failed to bring in competition for Mignolet during the summer transfer window, despite allowing Pepe Reina to join Bayern Munich on a permanent deal, and the Kop boss is now looking to bring Valdes to Anfield. The Reds were also linked with a move for Argentina’s World Cup goalkeeper Sergio Romero during the transfer window, but those rumours have come to nothing for the time being. Valdes saw his seemingly inevitable move to Monaco breakdown earlier this summer due to a serious knee injury, but having now recovered, it is possible that he could take the place of his compatriot Reina on Merseyside. After making 535 appearances in 12 seasons with the Spanish giants, Valdes is on the hunt for a fresh challenge. The keeper, capped 20 times by his country, is hoping to join a big club, and is prepared to wait in order to secure the best possible move. “He can sign a contract at any time and I am convinced that we will see Valdes at a big team before Christmas”, his agent Gines Carvajal told Cadena Ser last month.